The Airpax™ SNAPAK® series is a snap-acting hydraulicmagnetic circuit protector that combines power switching and accurate, reliable circuit protection in one aesthetically pleasing package. The SNAPAK® combines the functions of three separate components: power switch, fuse and fuse holder. To the OEM, this means that only one item has to be mounted instead of three. Less assembly is required, inventory is cut by twothirds and greater panel density is obtainable with less clutter. In addition, the SNAPAK® can be operated at either DC or 50/60Hz, eliminating the need to specify, order and stock separate units. 400Hz units are also available. To enhance front-panel aesthetics, SNAPAK® is offered with paddle and rocker handles in six attractive colors and push-pull and push-to-reset actuators. Also offered is a variety of optional mounting hardware. 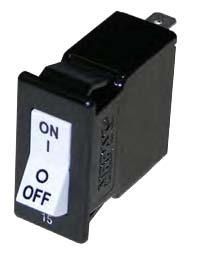 The push-pull version is supplied with a black button with a white indicating band. Orientation of the button when marked with an amperage notation must be specified when using the fourth decision table. Push-to-reset is supplied with a contrasting color indicating shaft. In addition, SNAPAK® is offered in SPST and DPST configurations. The single pole satisfies most applications. The two-pole version is often used for extra safety in products that utilize high voltage or where current sensing and breaking of both sides of the line is required. Quick connect terminals are standard, UNC 8-32 or M4 screw terminals are available as additional termination options. Since the SNAPAK® is snap-acting, it assures immediate opening and closing of the contacts. Its design also prevents operator “teasing” of the contacts and minimizes arcing. SNAPAK® circuit protectors are UL Recognized as supplementary protectors per UL STD. 1077, CSA Certified as supplementary protectors per CSA STD. C22.2 No. 235, VDE Approved as circuit breakers for equipment per STD. EN 60934, CCC Approved (customer must request product be manufactured in China) and CE Compliant. In addition, most versions are certified by UL to meet spacing requirements of IEC 950 for basic and functional insulation for front panel mounting. Consult factory for details and exceptions. Typical applications include office appliances, electronic data processing, medical equipment, business machines, vending and amusement machines. Push-pull versions are particularly well suited for medical instrumentation, automotive production transfer lines and other applications where accidental turn off is unacceptable. For those applications which do not require circuit protection, SNAPAK® is offered in a power-switch-only configuration. GVZ Components - ® diritti riservati.